Timber Mountain Log Ride is an excellent flume ride in Ghost Town and one of the best attractions at Knott's Berry Farm. The minimum height to ride is 36 inches. The Calico Log Ride opened July 11, 1969 with actor John Wayne and his son Ethan taking the first ride through the 85 foot by 330 foot mountain complete with a sawmill, valley, cavern, three forest scenes, and ending with a 42 foot thrilling descent into the log pond below. The forest scenes were created by Gene White. The ride cost 3.5 million dollars that Bud Hurlbut paid for from the earnings of his successful Calico Mine Ride that opened in 1960. Bud had paid Arrow Development Company in Mountain View, California to develop a water ride for him. However, Six Flags Over Texas wanted a water ride and Bud sold them his rights to the first Log Ride as he wanted all the "bugs" to be straightened out before he built the Knott's version. The Timber Mountain Log Ride, as it was later named, was the sixth Log Ride built by Arrow Development. In 2013, Knott's spent five million dollars contracting with Garner Holt Productions to revamp the scenes in the ride, adding dozens of new animatronic and more richly detailed setting throughout. 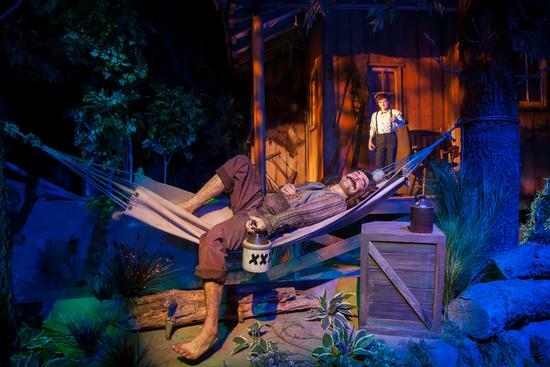 The "new" Log Ride opened on May 31, 2013, one day after its scheduled debut.